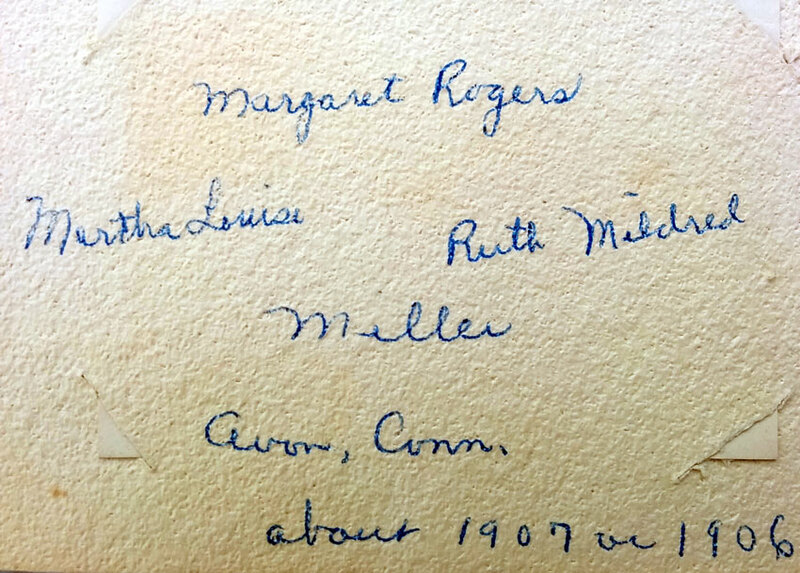 My grandmother, Martha Louise Miller, was born in Avon, Connecticut on August 3, 1900. Traditionally we have wonderful weather to celebrate her birth and today was no exception: bright and sunny with a cooling breeze; good for cutting hay or picking green beans, and remember to wear your bonnet! 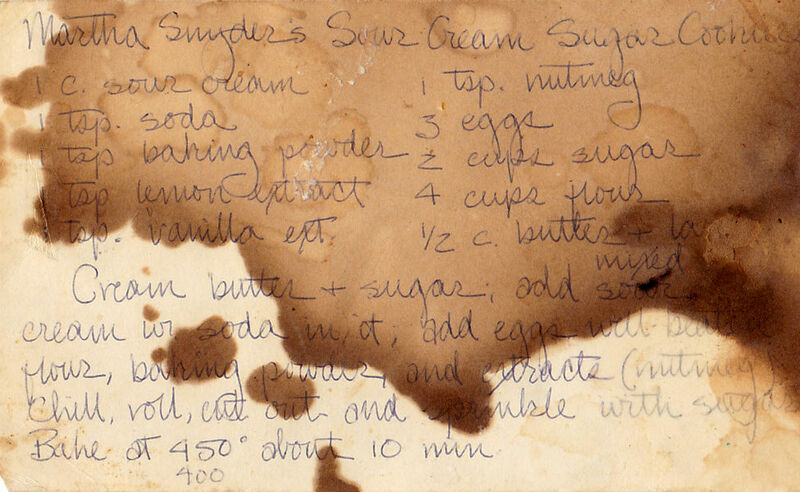 I went looking for a photograph to share on her day and found this being used as a bookmark in Psalms in a family bible. 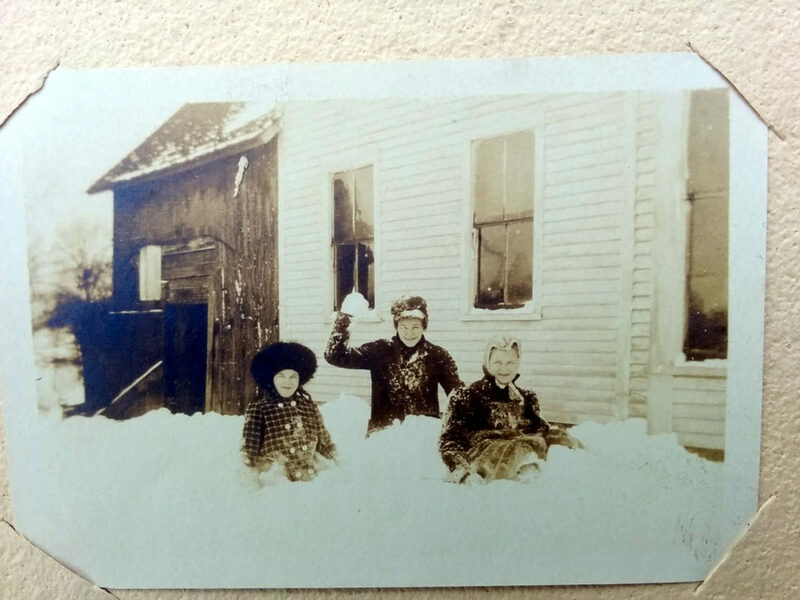 Here she is, on the left, about six years old with her two older sisters all wearing warm and stylish hats. 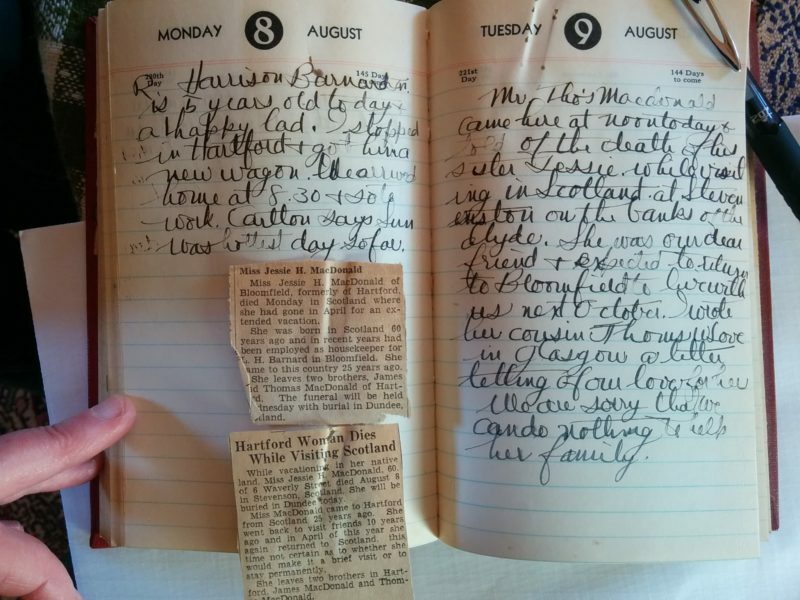 This entry was posted in family, gone but not forgotten, Holiday and tagged family, hardy ancestors, heritage, summer, winter on August 3, 2016 by APo. Many women (and men) in my home town commuted into the big city to work at one of the large department stores that crowded the main avenue. 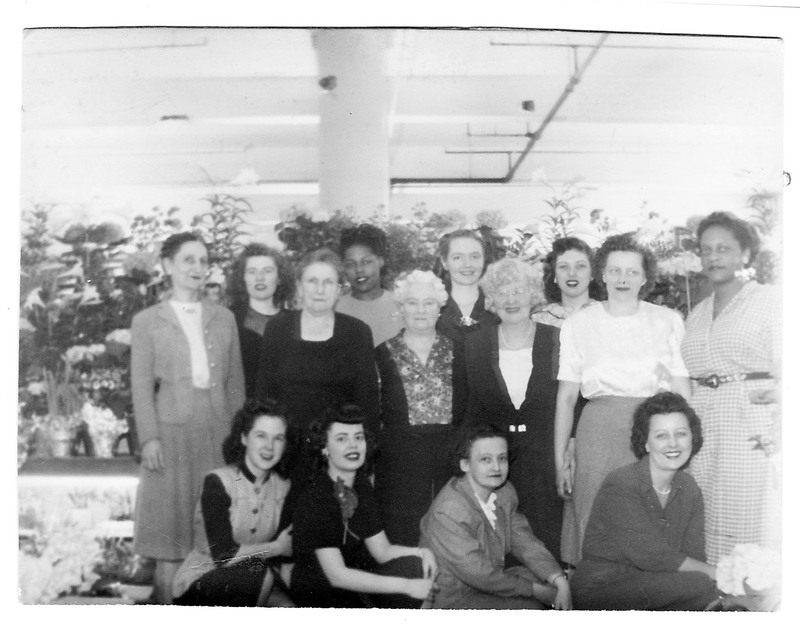 In honor of International Women’s Day, here is a photo of the Sage-Allen Notions Department staff in 1951. My mother, Harriet Barnard, is standing in the middle of the back row. 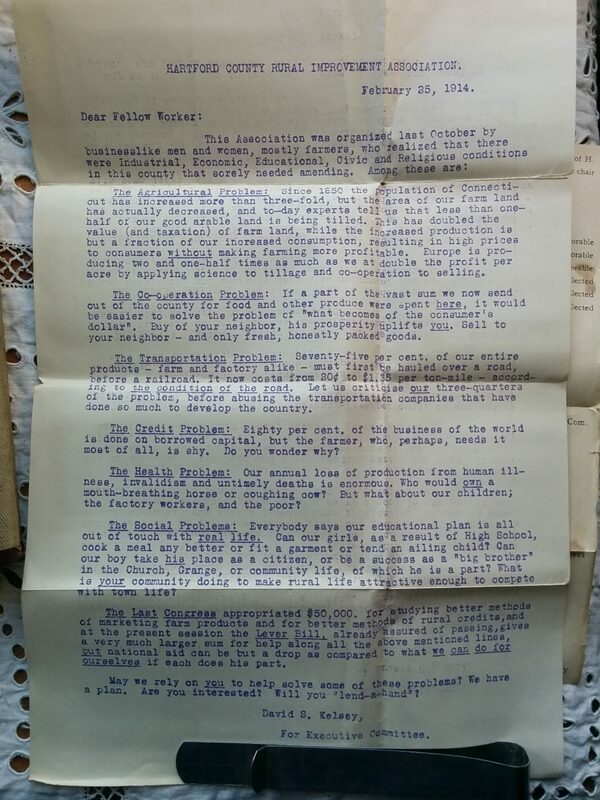 This entry was posted in family and tagged family, hardy ancestors on March 8, 2016 by APo. One of my New Year’s resolutions for this year was to close out my storage unit. The monthly fee could definitely be put to more productive use than to store plastic totes of papers and objects wrapped in tissue paper and the only thing standing in my way was the utter lack of storage space at home. I started in March by bringing home each new box only after dispersing (or disposing of) the contents of the previous haul, but the year is closing out and suddenly I have a pile of The Great Historical Unknown in the living room. It doesn’t help that the oldest material was at the back of the locker, and by old I mean that’s where the Civil War era spectacles and cigar boxes of cut-throat razors are hanging out. One box in the latest batch is packed with old papers – a 3 x 4 foot plastic vault of WWII ration books, blueprints, site surveys of farm buildings, order pads from the dairy, inventories of carriages and repair records, and, tucked away in a very worn copy of Walt Whitman poems, a letter home from my grandfather when he was an 24 year-old infantryman billeted in a French shack with 20 other men and an old iron stove. 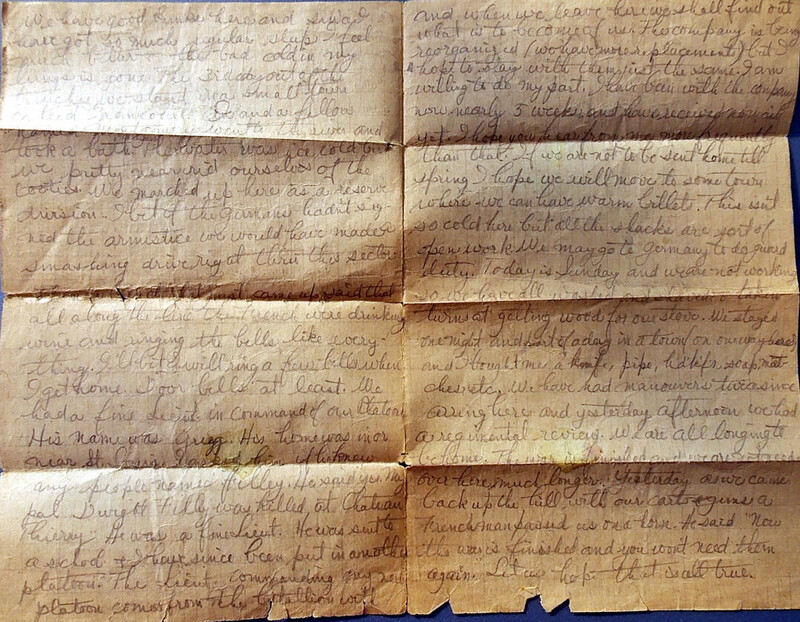 The letter is on lined paper worn tissue-thin with age and written in blunt pencil. 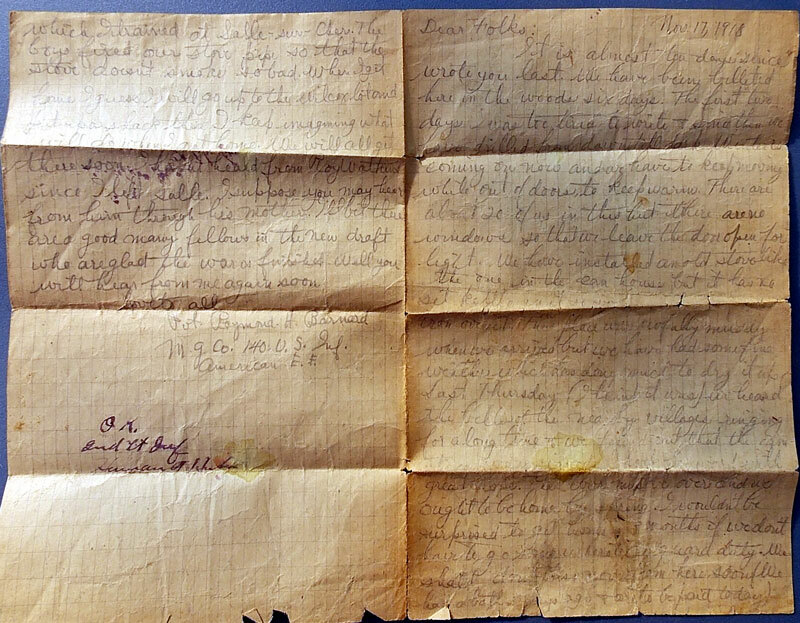 Parts are illegible but most of the script has survived the last century remarkably intact. His C.O. has scrawled “OK” on the last page in ink, presumably approving it for mailing. I’ve transcribed what I could below. Pvt. 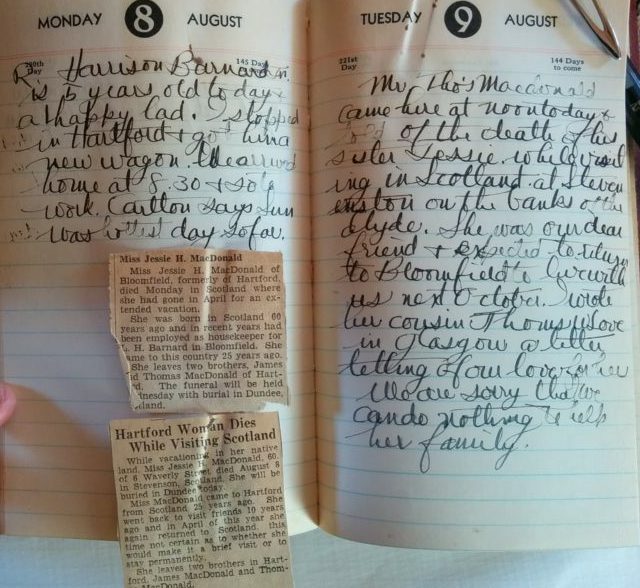 Raymond Harrison Barnard survived the war and married my grandmother in 1926; my mother was born in ’28. He died on his farm in Bloomfield, Connecticut in 1947. It is almost ten days since I wrote you last. We have been billeted here in the woods six days. The first two days I was too cold to write since then we have drilled four days till dark. Winter’s coming on now and we have to keep moving while out of doors to keep warm. There are about 20 of us in this hut. There are no windows so that we leave the door open for light. We have installed an old stove like the one in the <old?> house but it has no place to set a kettle on it so we can’t cook. The floor was awfully muddy when we arrived but we have had some fine weather which has done well to dry it up. Last Thursday (I think it was) I heard the bells of the nearby villages ringing for a long time and we figured out that the armistice was signed. I look forward with great hope. M. I would be surprised to get home in three months if we don’t have to go somewhere to do guard duty. We shall doubtless move from here soon. (We had a bath 3 days ago and are to be paid today!) I do not know what is to become of us. The company is being reorganized (we have more replacements) but I hope to stay with them just the same. I am willing to do my part. Have been with the company now nearly 5 weeks and have received no mail yet. I hope you hear from me more frequently than that. If we are not to be sent home till spring I hope we will move to some town where we can have warm billets. This isn’t so cold here but all the shacks are sort of open work. We may go to Germany to do guard duty. We have better bunks here and I have got so much regular sleep. I feel much better and that bad cold in my lungs is gone. The 3rd day out of the trenches we stayed in a small town called Francourt. I and a fellow named Montgomery went to the river and took a bath. The water was ice cold but we pretty near rid ourselves of the cooties. We marched up here as a reserve division. I get if the Germans hadn’t signed the armistice we would have made a smashing drive right thru this sector. Today is Sunday and we are not working so we have all washed and shaved and taken turns at getting wood for our stove. We stayed one night and part of a day in a town on our way here and I bought me a knife, pipe, h’d’k’f’s, soap, matches, etc. We have had manouvers twice since arriving here and yesterday afternoon we had a regimental review. We are all longing to be home. The war is finished and we are not needed over here much longer. Yesterday as we came back up the hill with our carts and guns a Frenchman passed us on a horse. He said “Now this war is finished and you won’t need them again.” Let us hope that is all true. The new Srgt that just came up said that all along the line the French were drinking wine and ringing the bells like everything. I’ll bet I will ring a few bells when I get home. Door bells at least. We had a fine Lieut in command of our Platoon. His name was Gregg. His home was in or near St. Louis. I asked him if he knew any people named Filley. He said yes. My pal Dwight Filley was killed at Chateau Thierry. He was a fine Lieut. He was sent to a school and I have since been put in another platoon. The Lieut Commanding my new platoon comes from the batallion with which I trained at Salle-sur-Cher.The boys fixed our stove pipe so that the stove doesn’t smoke so bad. When I get home I guess I will go up to the Wilcox lot and put up a shack there. I keep imagining what I will do when I get home. We will all get together soon. I haven’t heard from Ray Watkins since I left Salle. I suppose you may hear from him through his mother. I’ll bet there are a good many fellows in the new draft who are glad the war is finished. Well, you will hear from me again soon. This entry was posted in family, gone but not forgotten and tagged hardy ancestors, rememberance, winter on December 12, 2015 by APo. 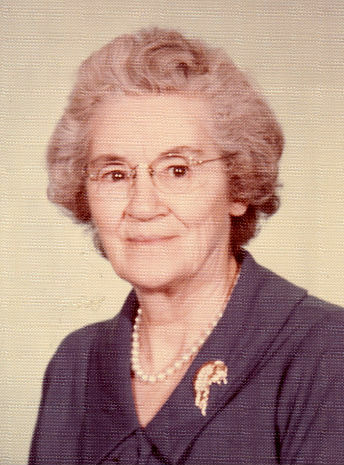 My mother turned 87 on Friday, and in the past I’ve posted a photo in her honor. 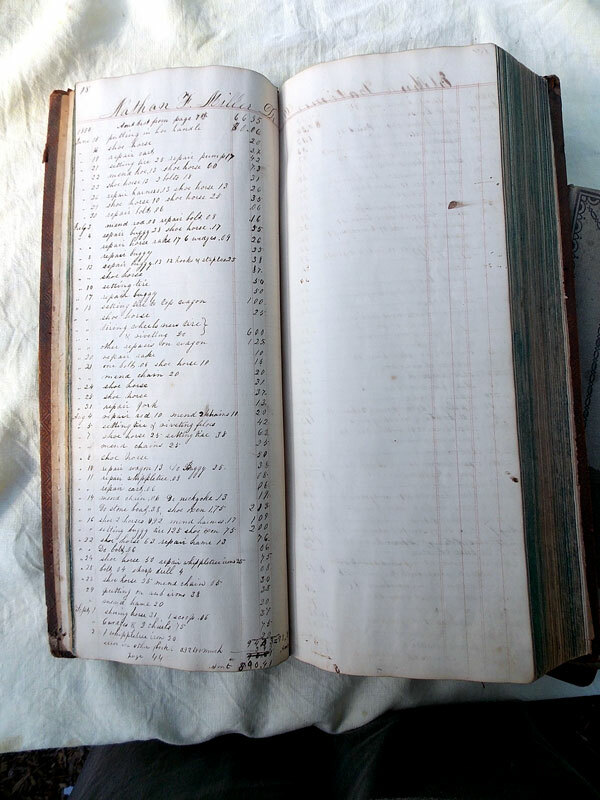 While looking through the archives for something suitable this year I turned up a set of ledgers from the 1800’s. 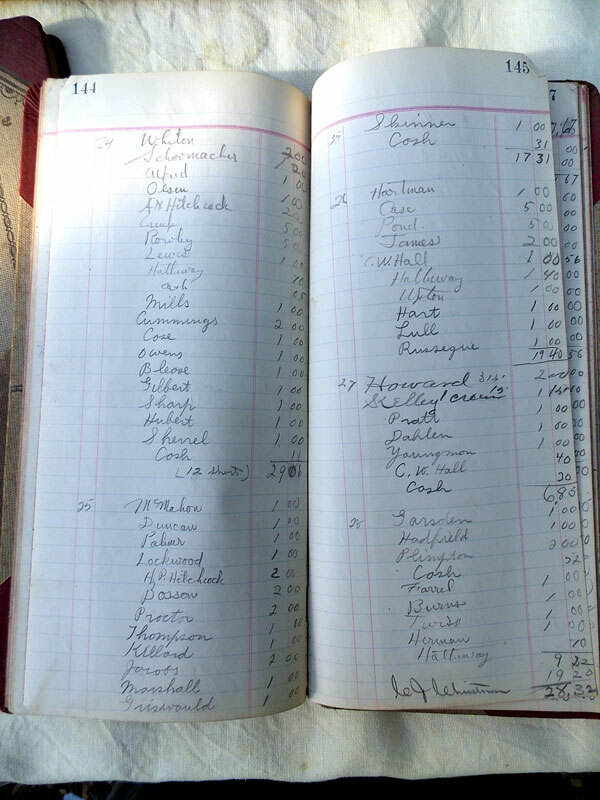 She loved reading the lists and prices of tasks and addresses from the past in their elegant copperplate. 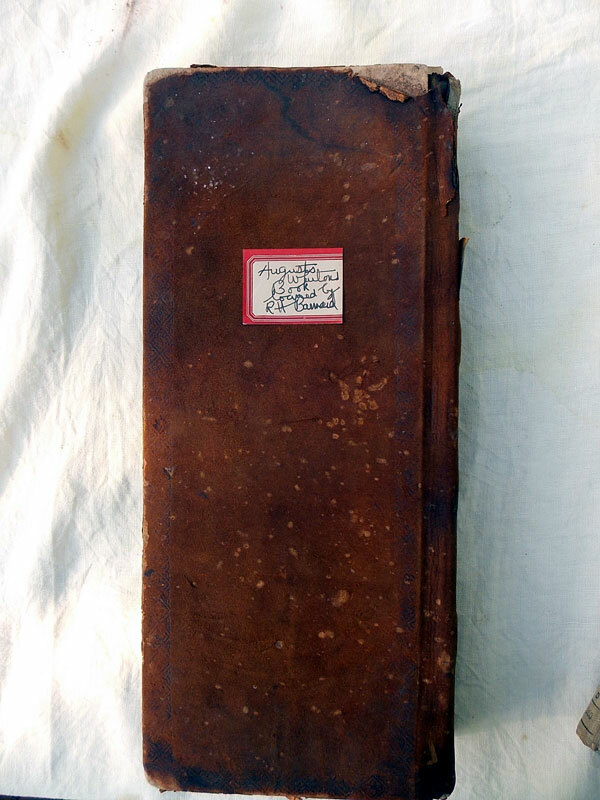 The label on this 1858 volume indicates that it belonged to Augustus Whiton and was loaned by my grandfather, Raymond Harrison Barnard, probably for an exhibit at the town’s historical society. Ancestry.com helpfully informs me that Augustus is related to me as “father-in-law of a great grand Aunt”. (Seriously, that’s very helpful – it would have taken me hours to figure that out on paper.) He was born in Ashford (Windham), Connecticut in 1808 and died in Bloomfield, where his carriage business was located, on July 1, 1885. 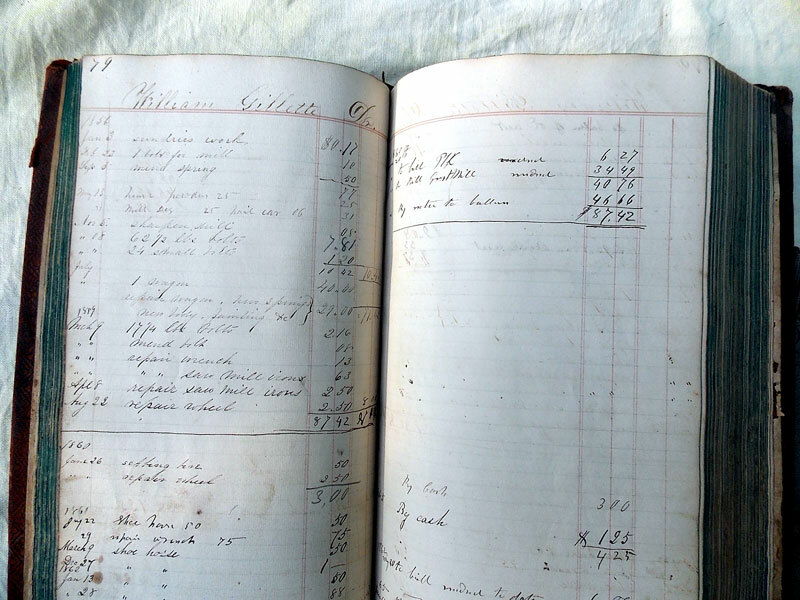 His accounts from 1858 are a wonderful collection of names that now adorn streets and plaques: Filley, Gillette, Miller from a time when it cost six cents to shoe a horse and twenty-three cents to repair a tire. This is Dr. Nathan Miller’s page. 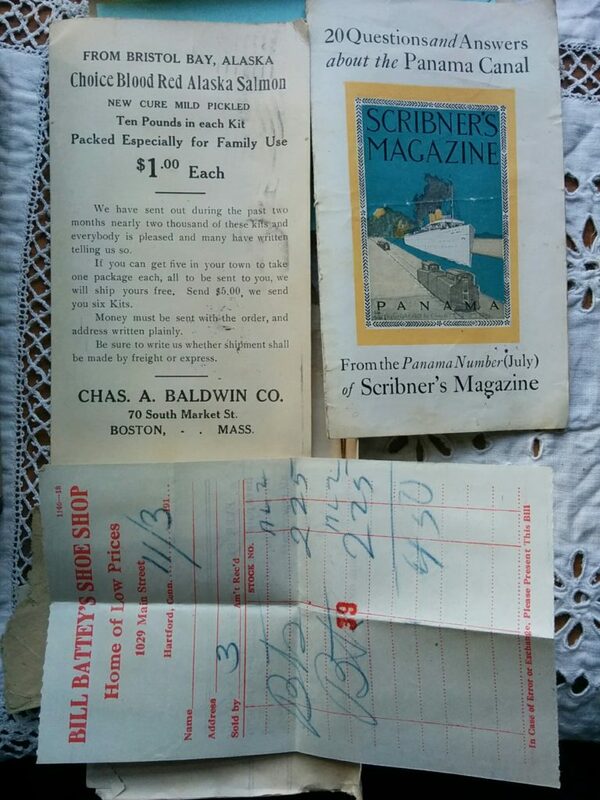 And one from William Gillette, a big spender at $87.42. Reading down the list makes a sort of historical poem out of the information: shoe horse, shoe horse, shoe oxen, repair whiffletree, shoe horse(s), fix buggy, reset tire, sharpen crowbar, shoe horse, shoe horse. . . .
Other books in the collection include the ledgers for my grandfather’s dairy deliveries. 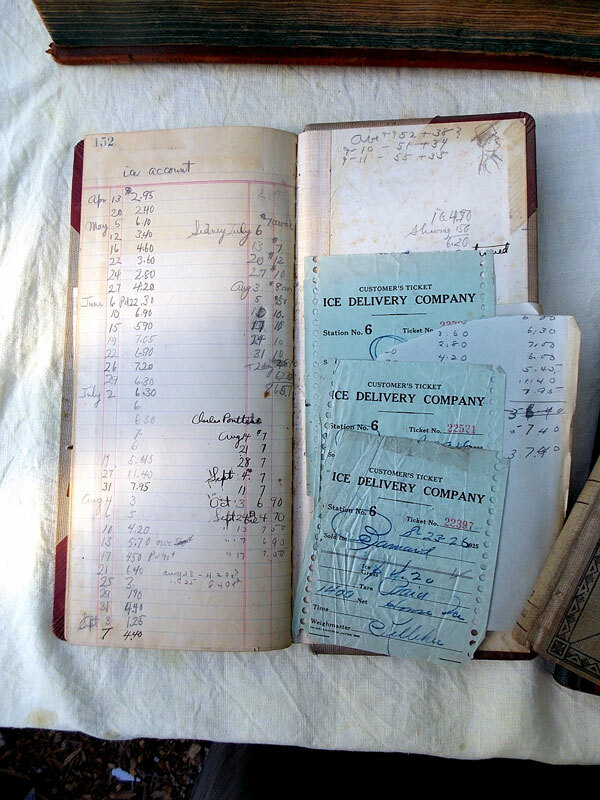 This one, labeled “The Hill Route” still has receipts from the Ice Delivery Company dated 1926. This entry was posted in family, gone but not forgotten and tagged autumn, family, hardy ancestors on October 12, 2015 by APo. 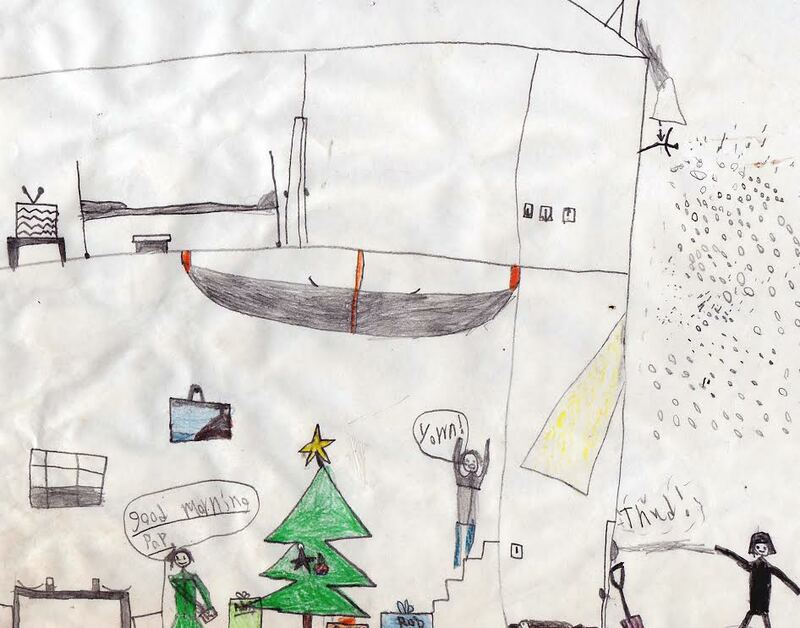 This awesome holiday drawing was done by our son, circa 1995. We built this house when Boy was a toddler, so there some things have received more emphasis than they might have from a child that didn’t witness quite so much construction for instance – light switches. As in, hey – we now have electricity! Yes, we did store kayaks on hooks from the ceiling. 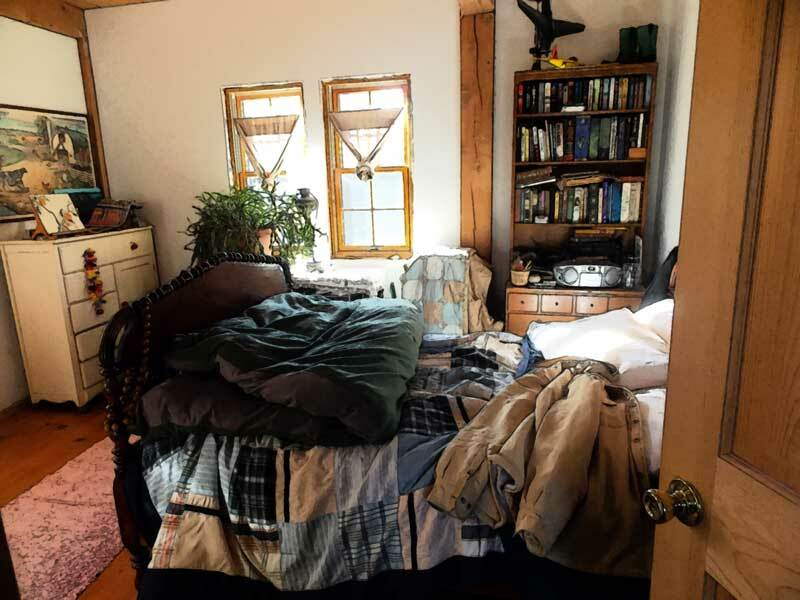 In our defense, it’s a very small house with very high ceilings and it seemed like a good idea at the time? Snow falls off that steep metal roof like king-sized mattresses being dropped from 40′. It sounds like thunder and was obviously a big part of his childhood. Our neighbors were often in the front yard, spoiling for a snowball fight. I don’t remember the Darth Vader get-up but it’s possible. 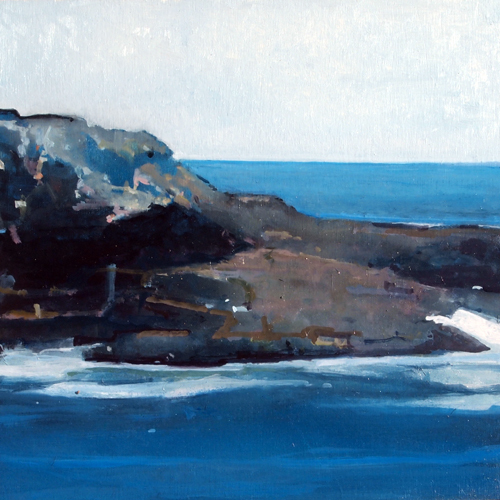 My partner is a landscape painter. That painting hanging on the wall is a pretty good reproduction of a Robert Pollien. May your season now be merry, and may you have joyous records of the time spent before! This entry was posted in art, family, Holiday, Maine and tagged drawing, family, neighbors, winter on December 24, 2014 by APo. 1. How long has this foolishness been going on? About 15 years now. 2. What is Social Capital? The Wikipedia article is pretty good. I find myself aligned with Francis Fukuyama as opposed to Bill Putnam, who wrote the most commonly accessed book on the subject, “Bowling Alone”, and who I feel is heavily influenced by a false sense of nostalgia for the white male nirvana of the 1950’s in the US. Fukuyama describes social capital as “shared norms or values that promote social cooperation, instantiated in actual social relationships”, which I feel describes the owl-community fairly well. 2. How did the SCO get its start/How can I start a SCO on my road? One day I started cutting down a small spruce at the edge of the road and was interrupted (as one is with small children) before I chopped down the stripped trunk. A neighbor came by and plopped a yard-sale scare-owl on the convenient pole. Someone with a great imagination decided to dress it in a baby tee-shirt advertising the Common Ground Fair and here we are. I imagine you could start by setting a naked owl statue out by the side of the road and then quickly walking away – the key seems to be allowing anonymity, at least to start. Don’t spy on the owl goings-on! 3. What’s your favorite owl outfit? Someone added a mortar board (it might have been a party favor?) when our son graduated from high school. That was very sweet. 4. Do you ever dress the owl yourself?/What’s the easiest way to dress an owl (statue)? Generally the owl just shows up in a new outfit based on the season or an upcoming holiday. Patriots games are a big inspiration, and so is Halloween. Baby clothes from a thrift shop or yard sale used to be the easiest costumes to use, but now I buy small dog outfits when I can find them cheaply. They come with velcro fittings and come in a frankly frightening array of holiday/sports/occasion choices. 5. The owl has been exposed to 15 years of road salt and blistering Maine summers; will you find another one when the plastic finally crumbles? The owl is indeed faded and worn, and his/her eyes are not their original sparkling yellow. I think we’ll probably have a neighborhood wake and family burial in the back yard at some point, and then go looking for alternatives. Suggestions, anyone? 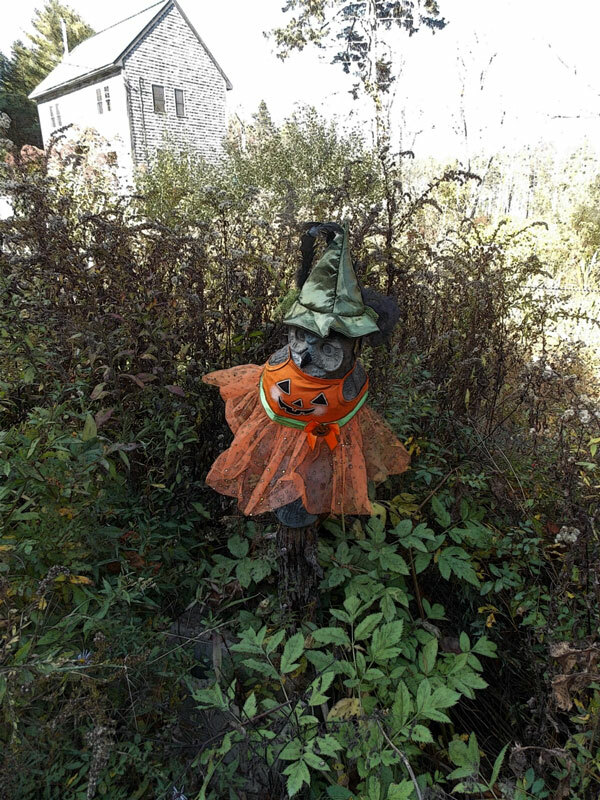 This entry was posted in family, Holiday, the backyard, the neighborhood and tagged social capital owl on October 11, 2014 by APo. This entry was posted in family and tagged Bar Harbor, family, poem, winter on November 30, 2013 by APo. You have at least one of these, right? A photograph that was so good you fixed it to the front of the fridge with two magnets and there it stayed, getting a little more foxed around the edges with every passing year. 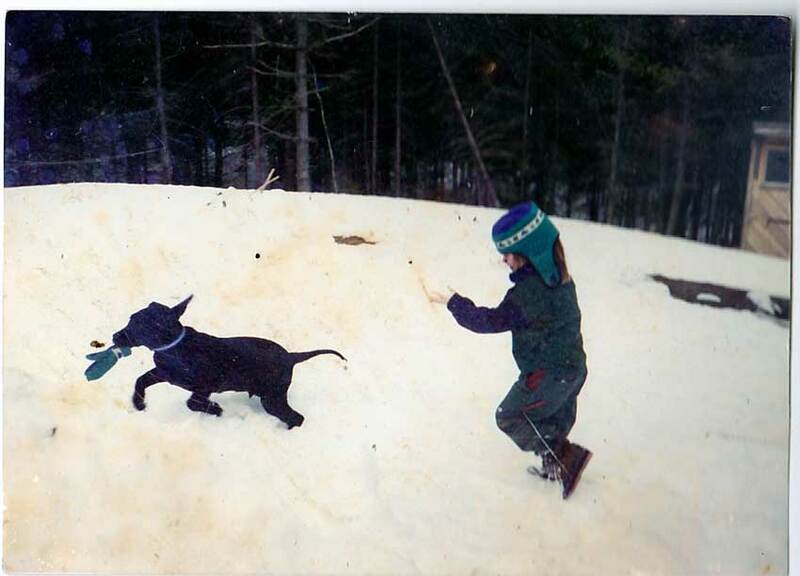 This is one of my favorites; a little boy with one mitten chasing a puppy – also with one mitten, in the backyard during a snowstorm. They’re not so little anymore. . . This entry was posted in family, the backyard and tagged family, winter on October 28, 2013 by APo.